It is problematic to bottle the Palestinian struggle and history into numeric stages. Over the past several weeks, international media have portrayed the current situation in Palestine and Israel as a ‘continuation of the cycle of violence’. Thus far, more than 75 Palestinians have been killed and 2,372 others have been injured. Eleven Israelis have been killed in stabbings or shootings. Many describe the situation as unstable and express frustration that it is yet another cycle of violence. But what seems to be occupying people’s minds the most is whether this is a third Palestinian Intifada or not. Though many Palestinians refer to the intifadas in their numerical order, the numbering of the uprisings was introduced by international and Israeli media. It is problematic to bottle the Palestinian struggle and history into mere numeric stages. Palestinians did not name the first intifada as such. To us, it was the intifada of stones. The second intifada was not named as such; it was the intifada of al-Aqsa mosque. The titles are meant to convey a message from the Palestinian people. They also contextualize the uprising within the larger picture of Israeli occupation. The ‘intifada of stones’ signifies the non-violent and symbolic approach of the uprising as well as its popular resistance. The ‘intifada of al-Aqsa’ refers to the consistent attacks on al-Aqsa mosque by the Israeli police and settlers, which reached their peak when the former Israeli Prime Minister Ariel Sharon invaded al-Aqsa compound in September 2000. The names suggest a sense of resistance and defense that the numbers cannot convey. There are two factors that make many hesitant to call this an intifada: inconsistency, and lack of leadership. So far, the Palestinian political parties have stood aside as observers, restricting their role to praising the protests. The Palestinian Authority has dismantled some protests and remained ambivalent to others. Furthermore, the clashes and protests move sporadically from one city to another, though most of the clashes seem to happen in East Jerusalem and Hebron. But our analysis of the current situation changes when we compare it with the previous intifadas. When the first intifada (or what Palestinians refer to as the intifada of stones) started in 1987, most of the Palestinian leadership was abroad. It took them by surprise. Though at the beginning there was a lack of leadership, a new one emerged from the streets and named itself the Unified National Leadership of the Intifada (UNLA). Then, coordination developed between the leadership abroad and the one on the ground. It is in the nature of intifadas to cause either changes in leadership, or a shift in the political rhetoric and vision of the existing leadership. Therefore, the lack of leadership is not enough of a justification to dismiss the possibility of a third intifada. The inconsistency of actions within the current situation is not a valid justification either. The actions might be sporadic and unexpected, but the spirit of staunch resistance is present and vivid. Though the question of a third intifada is an important one, it distracts our attention. Ultimately, it is only for the Palestinian people to announce an intifada. This is precisely the meaning of intifada—it is an uprising by the people. Our attention must instead be focused on the Israeli occupation and its rigorous machines of oppression. In other words, the question to be asked by the international community is: why do Palestinians even need an intifada? What is the reality that they live that drives a 19-year old student to stab a settler? One would think it is evident that occupation is the reason, but coverage by major newspapers and media outlets proves otherwise. The current atrocities are referred to as a ‘cycle of violence’, giving the impression that this violence is self-perpetuating. It is not a cycle. There is an occupier and an occupied. 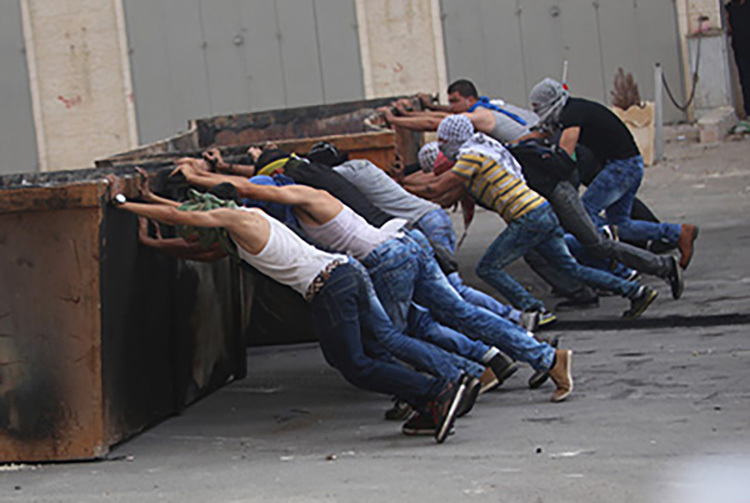 The upsurge of violence is in response to the occupation, whether it is an intifada or not. To honor the current suffering of the Palestinian people is to acknowledge this context of occupation. It is to respect and legitimize the messages they are trying to convey. Instead of analyzing whether Palestinians are seeking an intifada or not, think of the ways in which the international community can itself lead an intifada by proactively tracing its complicity with the Israeli occupation.